NEWEST ANDROID 7.1---2018 Newest A95X Pro Google Android TV Box is based on the Android 7.1.2 version OS, with high speed and smooth performance, designed to turn your regular TV into a smart one. BIG MEMOERY STORAGE---DDR3 2GB RAM and eMMC 16GB ROM, advantageous in performance, security and reliability, ascribing to the eMMC memory, ultimately delivering a richer end-user experience. It is the best choice for you to have the smooth experience to watch the video or play game. 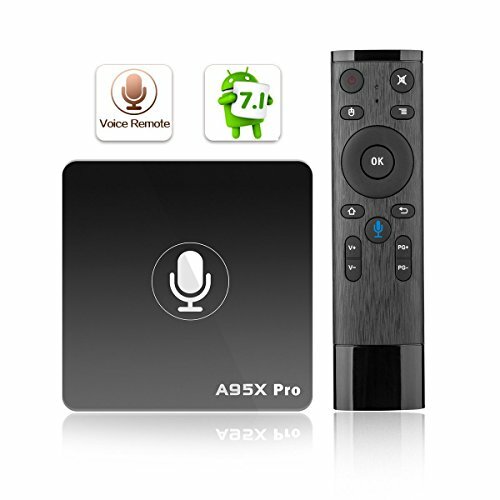 NEWEST REMOTE CONTROLLER---A95X PRO come with newest smart voice remote controller, support more than 200+ languages around the world, efficiently save time to typing . Users can search anything by talking to the remote controller. TRUE 4K UHD---A95X PRO Google android tv box plays just about any 4K sources you could throw at it. Furthermore, it moves out into reality the fantasy of VP9 hardware decoding. PLUG AND PLAY---Very easy to use. Just connect power and your TV, set up the box step by step within 5 mins, then start to enjoying it. You can easily downlaod all apps from google play store. If you have any questions about this product by TOJOYBOX, contact us by completing and submitting the form below. If you are looking for a specif part number, please include it with your message.